This website is currently being updated so we would like to apologize for any inconvenience and thank you for your patience. In the meantime please feel free to contact us if you have any questions. IBA Tour: In an effort to combat No-Shows at Tour Events, Repeat Offenders will in future have to prepay online if they wish to participate. The Minority are ruining it for the majority, having no regard for players having groups decimated or the tournament organisers who are doing their utmost to ensure an enjoyable playing atmosphere and maintain tour costs. International: All Players representing IBA on International duty abroad must have personal travel insurance cover for themselves. IBA are not responsible or liable for any expenses incurred whilst travelling. All players upon being notified of selection to represent IBA at an International, and having committed to travel, must provide Team Manager with non refundable deposit of 100 euro by date set by IBA Committee. *This deposit also applies to major International Events being held on home soil. Players will receive the deposit back from Team managers on the morning of travel. Failure to travel after committing will mean loss of deposit. There may be extreme circumstances which will affect a player travelling. In this and all cases The Committees decision will be final. 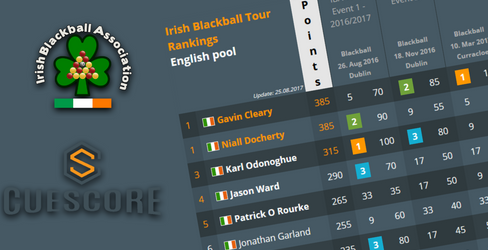 Thanks to Cuescore's JanOtto Weberg, We have a brand new Ranking system in place after he back engineered all of last season's Tour into the database. Pool Loses one of its own. It is with a heavy heart that we bring the very sad news, that one of our members, Dermot Byrne, has passed away. Dermot died in the early hours of Sunday 16th July 2017. 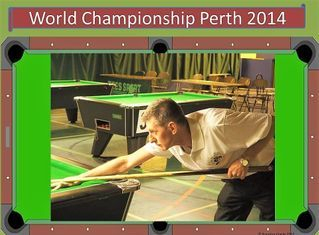 Dermot attended Irish Blackball Association Events for many years, and qualified through rankings to represent Ireland at European and World Championship Events, and was so proud to compete for his country. Dermot was known to all as a 'Gent'. He was easy going, and respectful of others. We are so proud to have had the opportunity of knowing Dermot, and the Honour of being in his company. On behalf of the entire membership of the Irish Blackball Association, we would like to offer our sincerest condolences to his loving wife, 3 beautiful daughters and extended family members at this time. Dutch Blackball Association: " Our condolences to all family and friends "
Colours: Black ,White ,Burgundy ,Royal blue ,Sky blue ,Navy blue ,Sunflower ,Orange ,Emerald ,Bottle green ,Pink. 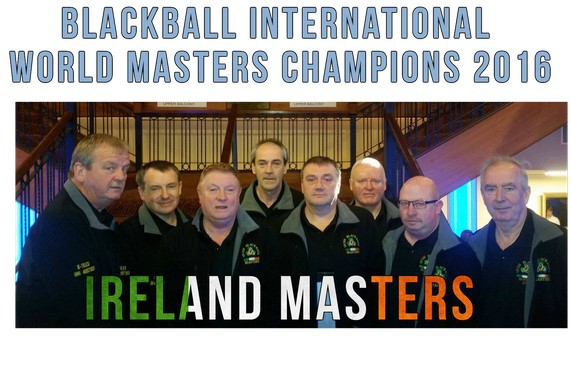 Congratulations to Irish Masters Team. Fantastic Performance by all the lads. 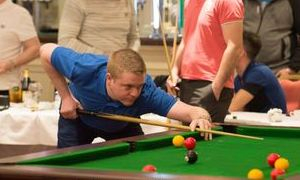 Great selection of pics from Irish Blackball Association Tour 1 Event which was held in the Regency Hotel, Dublin. 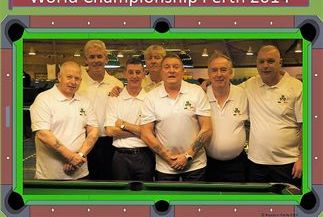 Click Pic on left to get straight through to the Photos provided by Andy Fleming.